National Examinations Board (NEB) has published results of Grade 12 for all faculties in both regular and partial side.Total 2, 99,675 examinees appeared in the examinations under the regular category, 41,375 have passed. Similarly, 35.2 percent have made through from the exempted category.This is the first time the result being published upon grading system. Out of 299,675 students appeared in the examinations under regular category, 1,169 students obtained 3.61 - 4 GPA while 11,221 students scored 3.21-3.60 GPA, 27,643 students got 2.81- 3.20 GPA. Similarly, 58,345 students received 2.41 - 2.80 GPA, 90,299 students scored 2.1 - 2.40 GPA, 66,438 students obtained 1.61 - 2 GPA, 22,734 got 1.21 -1.60 GPA, 4487 students scored 0.81 - 1.20 GPA and 999 students obtained 0.00 to 0.87 GPA. Likewise, out of 117,414 students taken part the examinations under partial category41,325 students have passed the examinations, as per NEB. This is the first time results of all faculties has been published at a same time. Earlier, results of science faculties were published first followed by other faculties.Grade 12 examination was held from Baisakh 14, 2075 (April 27, 2018) to Baishakh 29, 2075 (May 12, 2018). A total of 415,252 students, 208,276 male students and 206,975 female students from 3,912 schools across the country appeared for the exams. HOW TO VIEW NEB Class 12 results ! 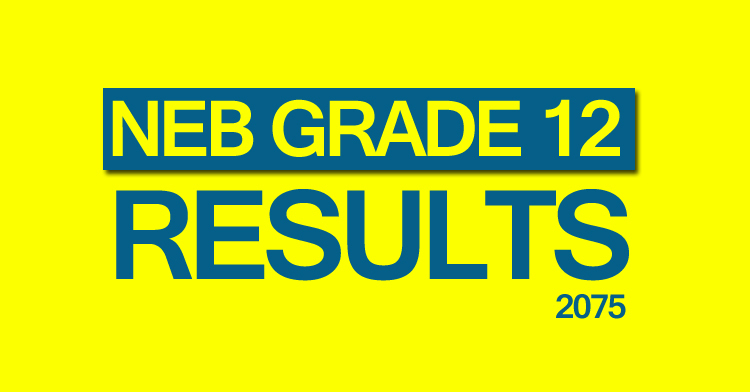 b.Grade 12 results can also be obtained through SMS by typing "Results (space) Symbol Number" and sending it to 35001. 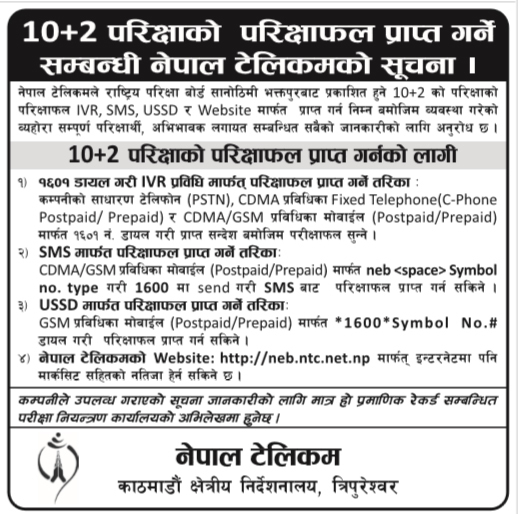 Last year, National Examination Board (NEB), Sanothimi, Bhaktapur published the results of Grade 12 Science on 4 August 2017.The examination of grade 12 was held in in Baishakh 10 to 22, 2074.79.44 per cent students under regular category passed the examination. There were 44,897 examinees appearing in the test out of which 35,668 passed. Likewise, under exempted category, 43.96per cent students went through.Out of 9,489 students sitting for the examination, 4,137 students passed the exam. Similarly, 17 students from regular and three from exempted were expelled. Last year, National Education Board (NEB), Sanothimi, bhaktapur published results of Grade 12 Management, Humanities and Education streams on 31 August 2017.Under Management, Humanities and Education faculties last year, 42.33 per cent students under regular category passed the examination. There were 193,125 examinees appearing in the test out of which 81,758 passed.Likewise, under partial category, 35.74 per cent students passed. Out of 107,569 students sitting for the examination, 38,444 students passed the exam. Similarly, 77 students from regular and 38 from exempted were expelled.